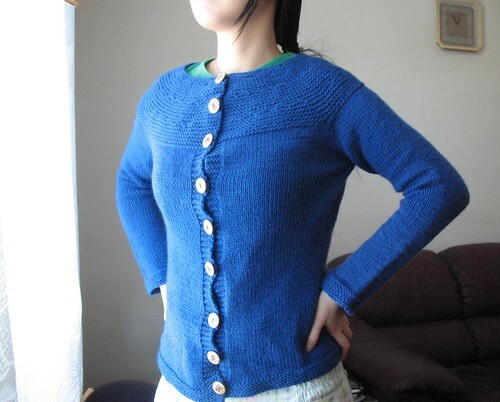 This cardigan took forever to finish. The knitting itself took about a month, but I didn’t block for another month after binding off and another week for the buttons. I was very careless with the button sewing, but I was so fed up with this project by this time that I didn’t care. Maybe in the far future, I will resew it. Until then, I can wear it as it is going out or staying in. It is far from my favourite sweater, but at least I can use it when out. 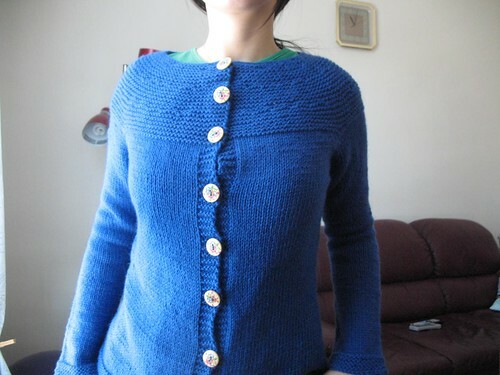 Garter Yoke Cardigan, started March 13th, 2012, Bound off April 18th 2012. Sewed buttons on May 19th 2012. Yarn: Patons Classic Wool – less than 4 skeins of the old yardage, not the new one. Needles: #6/4mm for the CO, #7/4.5mm for the garter, and #8/5.0mm for all else. CO on 93 sts (20 less) on 4.0mm and switched to 4.5mm for the yoke. Knit 2 rows. Increased 10 sts using M1L (KFB is better for garter stitch in retrospect). Knit 4 rows including a button hole row. Incresed 10 sts. K1 more row then began with short rows. For the yoke, I added two additional rows between button holes since my gauge was different. Switched to 5.0mm for stockinette. After initial stockinette inc row, I did M1L, K1, SlM, K1, K1R. Inc a few additional stitches for bust after separating sleeves and body. 4.5mm on yoke, cuff, and hem. Picked up 6 sts at underarm, decreased them, knit about 2.5-3”, then began sleeve decreases: k1, k2tog, knit around to the last 3 stitches, ssk, k1. Repeat every 8th row until only 40 sts. Cost of Project: Less than $20. Would I knit it again? Doubtful. If I were to do it again, KFB for the yoke as pattern says and I won’t be so careless with blocking and button sewing next time. I recognize those buttons… 😉 The ones you gave me are still sitting in a box waiting for a project. Hmm. The whole ensemble looks great! Hehe. This was my first time using the wood buttons too I think. It’s good to have a button stash though. 😀 Thanks for commenting! Hi Steph! Thanks for the comment. I can correct some basic mistakes in knitting, but honestly, I don’t really know how to correct some of them or don’t want to because I am lazy. I will learn to crochet some day though. Have a good day!